"These tools are required for assembling 069 �D� Series hose ends in sizes 4 through 12 to prevent cutting the hose inner tube. Size 16 through 32 mandrels are used as a holding device when assembling 069 �D� Series swivel ends. Mandrels can be "	"ordered individually or in sets as shown. " 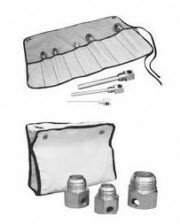 TH-8 Mandrel Set-Contains 1 each of the mandrels listed plus the pocket roll for convenient storage.